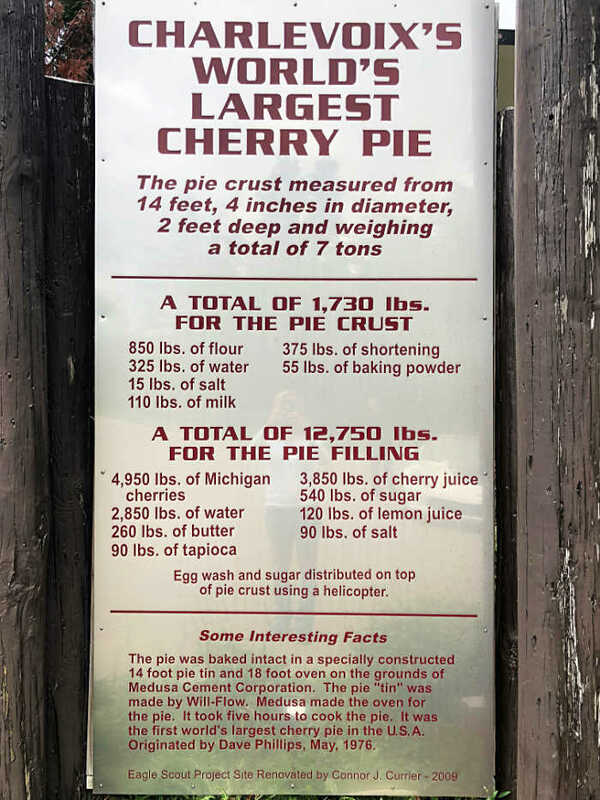 Worlds Largest Cherry Pie: Love visiting quirky places in Michigan? 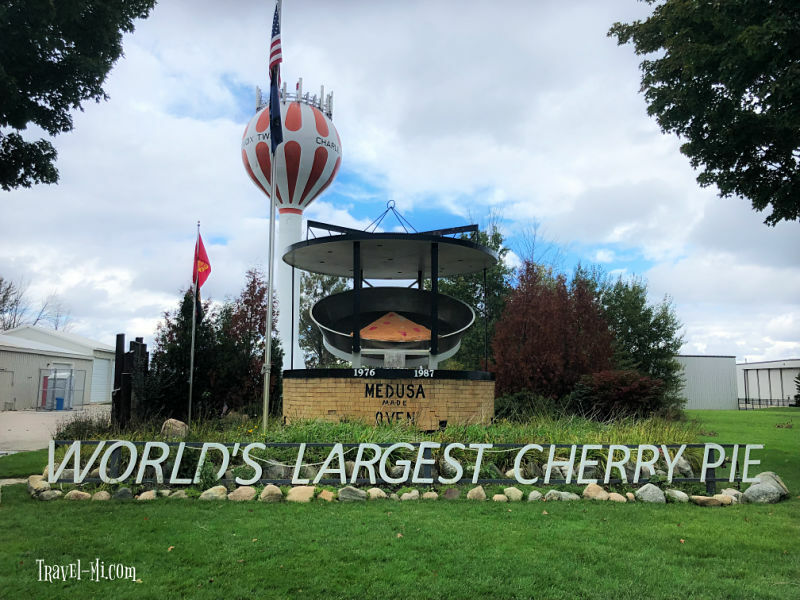 Well, look no further as Charlevoix Michigan held the title of the Worlds Largest Cherry Pie for over ten years! This is the actual tin that was used to bake the pie! It's an awesome spot for fun photos! It would have been fun to see the shocked faces of local Charlevoix business owners in 1976 when Dave Phillips, the owner of Grey Gables Inn, spoke to them about creating the world’s biggest cherry pie. Mr. Phillips was in the throes of planning different ways to celebrate the country’s upcoming bicentennial and also promote his restaurant. Cherry pie was a favorite desert served at Mr. Phillips' Inn and he knew several cherry farmers in Traverse City. He also worked hard to utilize local products. So, an idea was born! Go big or go home, right!? Luckily, several businesses agreed to join Mr. Phillips in his quest for Guinness Book of World Records fame. It was a huge undertaking to design and build the massive 14 foot pie pan. Medusa Cement Corporation agreed to have the work completed on their grounds and the pie "tin" was fabricated by Will-Flow. After lots of planning and construction trials and tribulations, Medusa created the massive 18 foot brick oven that triumphantly baked the first World's Largest Cherry Pie! It took five hours to bake!! Mr. Phillips utilized only Michigan ingredients: Cherries from Michigan orchards, sugar from Pioneer Sugar in Bay City and salt from the Detroit salt mines. Picture this: the crust mix was hauled to the pie tin in a Redi-Mix cement mixer and spread with lawn rollers. The pie filling was brought in by a dump truck. A crane then placed the pie into the massive brick oven. What's a cherry pie without a shiny and sugary crust? Egg wash and sugar was sprinkled on top of the pie crust using a helicopter! Can you just imaging Mr. Phillips dangling off the side of the helicopter with bags of goopy eggs and sugar yelling, "to the left! Closer!! OH! I missed, circle around again!" And So The Worlds Largest Cherry Pie Was Baked! Of course, you need special people to cut the massive pie! Mr. Phillips chose a couple local beauty queens and Detroit Lions star, Herb Orvis, to achieve the momentous task. They utilized a huge knife specially fabricated to cut the first World's Largest Cherry Pie. About 7,000 people were served somewhere around 10,000 slices of record-breaking pie. I bet it was unbelievably yummy! Mr. Phillips was a marketing genius! 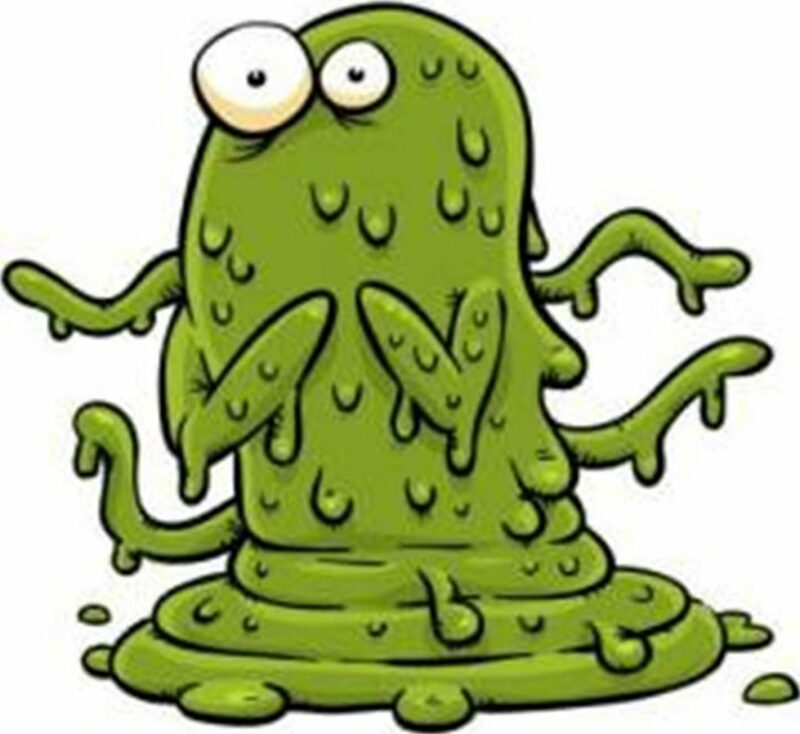 He received a letter from President Gerald Ford expressing his regrets for his inability to attend the famous pie cutting ceremony. Mr. Phillips was featured in several newspapers and magazines around the world celebrating his success. So this colossal pie held onto the record of World's Largest Cherry Pie for just over 10 years. 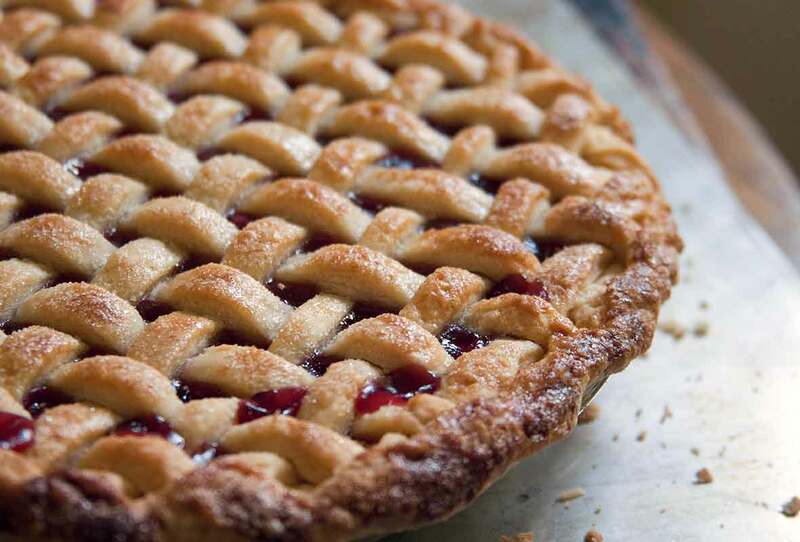 In 1987, Traverse City's cherry pie envy boiled over. During a heated town hall meeting, someone stood up and shouted, "Hey! We are the ones known for our cherry trees, it's time we turn up the heat and show those darn Charlevoixians who's the cherry boss!" At least that's how I pictured it all went down! 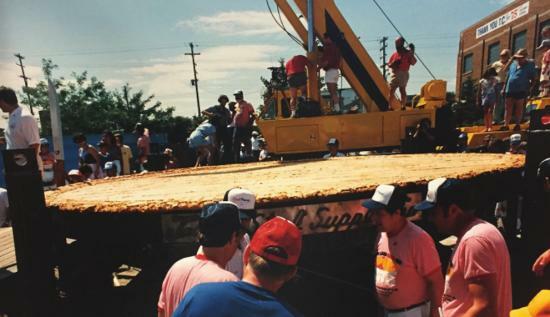 So Traverse City got to work and made their own monster cherry pie that weighed 28,350 pounds. And the townspeople rejoiced. Of course it didn't stop there, apparently Canada was also green eyed with envy so they had to outdo us a few years later. Boo, Canada. 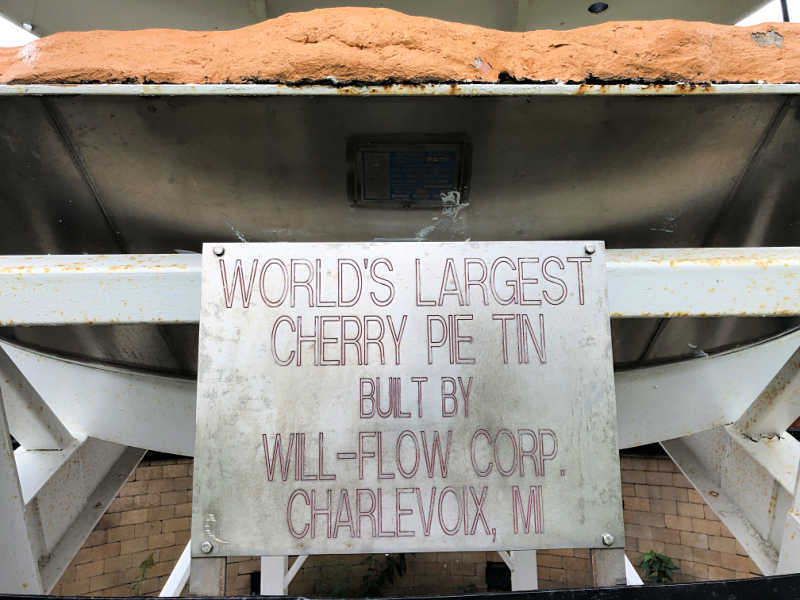 At least Charlevoix held onto the title of World's Largest Cherry Pie for ten years! Whoot! So I was unable to find a photo of the actual cherry pie made at Charlevoix but I found this photo above of the cherry pie made in Canada. Helps you visualize the massive undertaking and immense cost it must have been.